OnePoint is revolutionizing how your employees experience work. 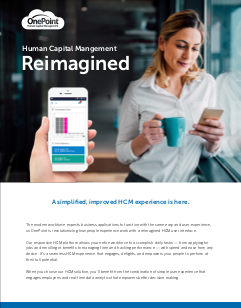 Our responsive HCM platform allows your entire workforce to accomplish daily tasks — time tracking, viewing schedules, enrolling in benefits and tracking performance — with speed and ease from any device. When you choose our seamless HCM experience you’ll benefit from a simple user experience that engages, delights, and empowers your people to perform at their full potential. Combined with real-time data analytics that empowers better decision making. Contact OnePoint for a demonstration of our unified HCM solutions for the modern workplace.